I started playing Final Fantasy 10 HD yesterday (it released a couple days earlier in Japan) and I have a burning question: Are these people part fish? Seriously how can they stay underwater for so long with no difficulty at all? At first I thought there was some kind of technology they were using but there is nothing visible so far. To be fair I'm only 3 and a half hours in, and with Final Fantasy that is basically the opening cutscene... but still! Other than that, I really like it so far. The voice acting can be kinda dated and cringe inducing at times, but it is still doing a good job of pulling me into the story. I'm a sucker for this sort of thing. Ancient civilizations, world ending threats, magic and technology all rolled together! The Yevon alphabets kinda remind us for Ancient Chinese letters long time ago. Btw, you will feel breathtaking to see Yuna has to do her job to send the dead body souls on Kilika Island after Sin destroyed the village. No, it's an effect of the pyreflies. Square really do have that "cool" rule but this was mentioned in Ultimania. It doesn't explain how they manage at non-blitzball locations though. Wakka and Tidus as blitzballers would have had a lot of underwater practice as would Rikku with her being an islander with a history of hunting sunken treasure. @Anti-Matter I haven't seen that yet, but I am pretty sure that is exactly the next scene I will be seeing. I just played through that fight last night and got to the island right after it. @Foxy-Goddess-Scotchy I mean yeah there's a lot of stuff going on that might be more extraordinary, but somehow they don't surprise me as much. I am just used to the portrayal of fantasy or sci-fi where they make some off hand comment referencing how they do something. Like having a forgetful character mention "I almost forgot my magic underwater breathing charm!" and then get berated by a responsible type or have a character mention in a cutscene "I'm glad my rebreather was built so durably!" Or if the cast could breathe underwater naturally I would not have expected them to be what appear to be normal humans. @King-X I just can't buy the "lots of underwater practice" reasoning if they are just human. No human can hold their breathe underwater like that, fight, work and move for so long. I mean, overall I don't mind, it doesn't break the game or anything for me, I just find it odd. Man... I see people already have the digital JP version, and even the physical JP/Asian version... here I am waiting for Tuesday to crawl along. I have the physical version on the way from Play-Asia, but it won’t get here before the digital version unlocks. Enjoyed some Darksiders and Unravel Two and LABO VR, but now... it’s Final Fantasy time. Already beat FFX on the Vita, but I’ll be going for a 2nd playthrough, and this time maybe playing X-2 afterward. Uh, I never get any phone calls or texts, and don’t recall ever giving out my number to them. Idk. You'd be surprised to hear that the record breath holding underwater is 24 minutes. Granted it's a different situation if you're very active underwater playing blitzball but as I already previously stated, blitzball water is affected by pyreflies. This is a comparatively tame physics issue compared to say... characters jumping 50ft in the air or casting high level magic. @King-X Yeah when I googled I saw some German guy lasted like 22 minutes. But even you point out how different that is from fighting and playing sports. They trained in the same diving school as 2D Mario and the Pokémon trainers from (gen 3) Hoenn/Unova. Are these people part fish? @Bunkerneath To be fair, it's not just Nintendo. The Vita release had the Vita equivalent of that banner as well, so technically Sony was the first to start with that (Nintendo's is a larger/bolder warning, but it's also symmetrical with the Switch logo rather than a random box on the cover.) The PS4 release had both on disc IIRC, though I had the steelbook edition so standard may be different. @Foxy-Goddess-Scotchy You mean you started with X-2 and actually came back to play other games in the same series?! Wasn't really into RPG's, JRPG's in particular @NEStalgia . True I'd played Pokémon but... I dunno never really classed it as an RPG back then. FFX-2 was on sale for like £15/£20 all the way back in 2004/5 and I ended up buying it on a complete whim. Knew absolutely nothing about it. Ended up enjoying it immensely and yeah... Here I am, lover of RPG's and all sorts. @Bunkerneath Yeah, I hate when they do placeholder art. It's probably just a badly optimized port. 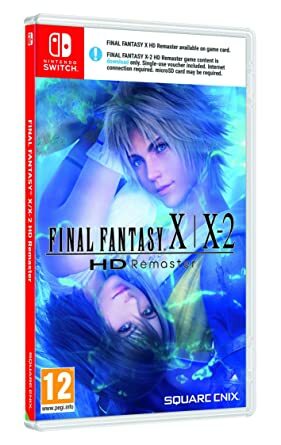 Btw, this year will be 10th Anniversary of FF XIII, so if there is any chance to be ported to PS4, Switch and Xbox One, i might consider the Switch version but not as the Trilogy.